Everyone says that you should go and see Shelton on a sunny day. Well, I couldn't have picked worse weather. Norfolk was huddled under the greyest day of the winter so far, low cloud, fog and drizzle all competing to see which could make the day most miserable. And yet, even in this gloom, there was something totally uplifting about this little church set back from the narrow lane in a wintery graveyard. There is no doubt that Perpendicular architecture is at its best on a small scale, whether at Denston and Ipswich St Mary Quay in Suffolk, or here at Shelton. Not so much a jewel, more like one of those faberge eggs, intricate and delicate but as efficient as clockwork. Sir Ralph Shelton, High Sheriff of Norfolk in the mid-15th century, paid for all this, and even in its unfinished state it is superb. Shelton wanted our prayers for his soul in perpetuity, but he must make do with the fact that this building is still filled with his emblem, and that it will be hard ever to forget what he caused to be built here. Unlike the rather severe exterior of Denston, Shelton has a touch of gorgeousness about it, because the vast porch and south aisle are built in banded brick. As usual, the clerestory is faced in stone, and so only the earlier tower remains to speak of flint. If the Reformation hadn't intervened then that too would have been rebuilt, probably in stone. As a result of it being cancelled, the entrance to the room above the porch had to be bridged in from the present tower stairs - probably, a westward extension to the aisle was originally planned, but this was also abandoned, leaving the present curious west side to the porch. As I stood in the porch I could look up through the unfinished vaulting to see the blocked door from the tower stairs and a window into the church. This was the last secret space I saw here. Stepping into the church itself, I felt my breath taken, both by the bone-chilling cold and the sheer thrill of light, an instant reminder of Denston. The arcades are like trees in a glade. My eye was drawn inextricably upwards and eastwards, the building opening out immediately without complexity Here was the perfect example of late medieval rationalism in stone and brick. The height of the unbroken nave and chancel is accentuated by the fact that the hammerbeam roof has gone - only its corbels remain. Supposedly, it was taken away in the 18th century to be used for a tithe barn. The white ceilure that replaced it seemed higher than the sky outside. Shelton is justifiably famous for its architecture, but unlike Denston it is not a great medieval treasure house. The intervening centuries have made a heavy mark here, and not much survives. Best of all is the east window, which is unusually tall and thin, echoing the forest architcture around it. As I said, Shelton has an unbroken line of nave and chancel, and as at Denston was probably planned that way - there would never have been a chancel built to the east. Indeed, Shelton has a sacristy immediately behind the altar, contemporary with the window above. The glass is superb, some of the best in south Norfolk. The fifteenth and sixteenth century figures in the east window are almost entirely donors at prayer, members of the Shelton family accompanied by the Shelton crest of a yellow cross on an azure shield. There is an Annunciation at the top. Mary in the middle is modern. The glass in the north aisle is perhaps even more interesting, with two Annunciation scenes in the upper lights and continental glass below, including a wonderful Resurrection. There's more medieval glass in the south aisle. The topmost centre panel is 20th century, depicting St Edmund and (I think) St Edward the Confessor - it may be by the Dennis King workshop of Norwich. Shelton tombs form great blocks jutting out of the east wall, dividing the aisles from the chancel itself. As at Denston, a rood screen crosses the full length of the church to delineate the chancel from the nave. A couple of curiosities: high above the tower arch is a vast William III royal arms carved in stone. It was given to the parish as part of the 1880s restoration. Rather less glorious is the tomb to Sir Robert Houghton in the south-east corner. Houghton and his wife, along with two children, glower miserably at each other as they kneel like chess pieces on the tomb top. The skull, crudely painted onto the pediment, seems to laugh at them. Even for those puritan times it is a dour piece, and rather out of keeping here. It is worth saying that, to our enormous good fortune, Shelton falls within the Hempnall group of parishes (as, indeed, does equally famous Fritton). 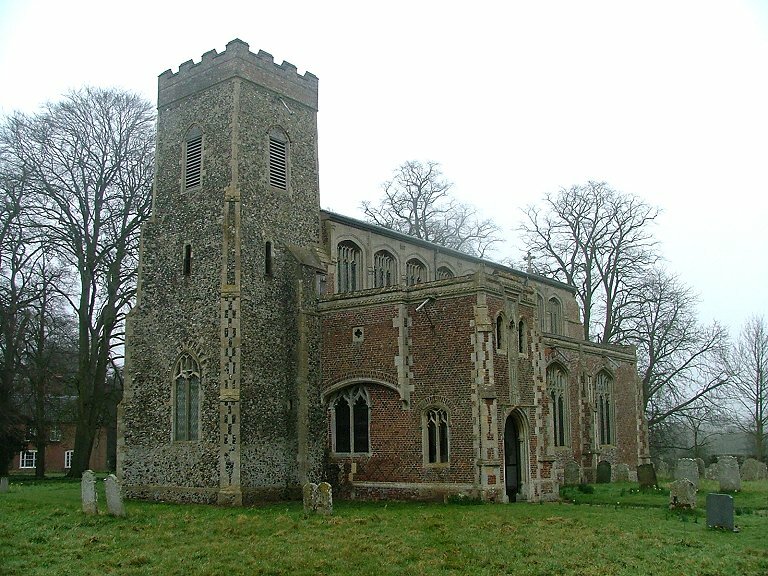 These seven churches are some of the most welcoming I have come across in East Anglia - lovingly cared-for, well-used, and all of them open to strangers and pilgrims every day.